The Sri Kalahasthi Temple is one of the 'Pancha Bootha Sthalangal' of Lord Shiva, which represents the Wind. 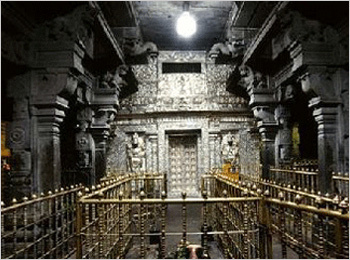 This temple is situated in Kalahasthi, which is about 38 kilometres away from Tirupati. It is one of the most famous Temples of Lord Shiva and is called 'Dakshin Kailash'. It is situated on the eastern bank of River Swarnamukhi.The temple is believed to be the powerful parihara sthalam for anyone who has Rahu-Kethu dosha. A person with this dosha can do their pariharam to get relieved from any issues at this temple. Srikalahasti derives its name from His ardent devotees. The devotees are a spider called Sri, a serpent called Kala and an elephant called Hasti. The Kalathiappar Temple is one of the most impressive Shiva temples in India. It is one of the ancient temples built during Pallava era and the current existing structure was built by the Tamil Chola King Kulothunga Cholan I, II and III in 11th century. This temple features an enormous, ancient gopuram (entrance tower) over the main gate. The tower is 36.5 m (120 ft) high. The entire temple is carved out of the side of a huge stone hill. An idol of Kannappar is installed in the Mandap adjacent to the sanctum sanctorum. There are two Nandhis (bull vehicle of Lord Shiva) in front of the presiding deity, one made of white stone and other of brass. The sanctum sanctorum is constructed in the shape of an Agazhi – a deep and broad water defence arrangement around the palaces of the kings to prevent entry of enemies. There are Ganapathi, Dakshinamurthi, Lingodhbhava, Brahmma, Durga on the inner corridors. There is a metal covered flag post and also a 60 feet tall flag post made of a single stone. There are also a Balipeeta and Nandhi in front of the temple. Around the 10th century, the Chola kings renovated the temple and constructed the main structure. The 120 feet (37m) high main gopuram and the 100 pillar mandapam were constructed by Krishnadevaraya, the Vijayanagara King in 1516. There is a temple for Lord Manikandeswara on the slopes of the hill through which Kannappar climbed the hill taking his Abishek Water from Ponmuhali river. There is also a mandap called Manikarnika Gattam near this temple carved out of the hill. The story goes that it is here Lord Shiva uttered the Tharaka Mantra to a women (commonly known as Karna Manthra being uttered on the ears of the departing soul) as Lord Viswanatha did in Kasi – Varanasi to a devotee. Following this tradition, devotees use to bring those nearing their end to Manikarnika Gattam and place them lying here so that the last breath may leave the mortal body through the right ear. The Thala Virutcham is a Vilwa Tree and the Theertham is River Ponmuhali, i.e., River Swarnamukhi. The Presiding deity of this temple is Thiru Kalahasthiswara, who is also known as Thiru Kalathiappar. He is seen blessing devotees along with his consort Goddess Sri Gnana Prasoonambikai, also called Gnanmbikai and Gnanasundari. Lord Shiva is worshipped in the form of a self-manifested Linga white in color. This Swayambu Linga was untouched from the beginning, even by the priests. The shrine of Lord Kalahasthiswara and Gnana Prasunambika are on a raised platform in the third enclosure of the temple. Siva is seen to be facing the West and Parvati is in the standing posture facing East. Lord Shiva is 'Abisheka Priya' (ceremonial bath), the Abishekam for the Lord is performed in the form of Scented water, Ashes, Honey, Rice, Sandal Paste, Flower, Panchamrutham, Water of Tender coconut etc.. on the Ustava Murthi. The Kavacha covering the Lord has the symbols of the planets, hence there is no separate shrine for the Navagrahas except for Saturn. Garlands are not offered on the body of Lord. An angi – upper cloth – is placed on the Lord on which Thumba Flower Garland is placed. In the Oddiyanam (belt made of gold studded with pearls and precious stones), of Mother Gnanaprasunambikai, the symbol of planet Kethu is carved. Procession of Lord is taken from the North tower entrance. As Maharish is worshipped the Lord facing the east after a dip in the Ponmuhali river, Lord Kalathiappar is facing west to bless the Rishis. There is a small shrine dedicated to Dakshinamurthy at the entrance of the temple who is regarded as one of the forms of Lord Shiva. Other than these there are many deities and idols dedicated to Venkateswara, Vinayaka, Nataraja, Subhramanya, Surya, Nayanars and also replica Lingas of other famous Shiva temples all over India. By the way, do not forget to see the Pathala Ganapathi who is associated with the old Sivalingam beneath the temple. We cannot see the Old SivaLingam (related to the old Story of SriKalaHasti) beneath the temple but we can imagine it (and the real story) when we see the Lord Ganapathi .Patala Ganapati is a small underground temple located in the temple complex. Pilgrims should make it a point to visit this interesting place. One has to bow down carefully to worship this Ganapati 20 feet below on a very narrow staircase. The legend has that, Umanabha the son of Vishwakarma (Celestial Architect) was an excellent sculptor. He started creating replica of the creations of Lord Brahma. This made Lord Brahma agitated and cursed Umanabha to become a Spider. Umanabha turned out a Spider, realized his mistake pleaded Lord Brahma. In order to get relieved out of the curse, Lord Brahma advised Umanabha to worship Lord Shiva at this temple. The spider became an ardent devotee of Lord Shiva and started to build a temple for Lord Shiva, did so with a threadlike material coming from its stomach. It built towers, Mandaps, the sanctum sanctorum, the pots on the tower (Kalasam), the compound wall etc. It was also doing the repairs when its threads were cut in places. To test the determined devotion of the spider, the Lord kindled up the lamp in the temple and burnt the Spider’s work. The spider, seeing its thread temple reduced to ashes, decided to fall on the fire and end itself. The Lord appeared before the spider and held the spider in His hands offering a boon. The spider begged the Lord a place at His feet in the shape of a flame. Lord granted the boon. Towards the end of Thredha Yuga, a snake named Kalan, was worshipping the Lord with precious stones on His head. An elephant named Athi also worshipped the Lord performing abishek with Ponmuhali river water and Vilwa leaves, removing the precious stones on the Lord’s head. This happened in Dwapara Yuga. The elephant and snake were both worshipping God in turn, one undoing the worship of the other. To find the enemy, the snake hid itself in the flowers placed by the elephant. The elephant, happy to see its flowers in order on the Lord began the abishek performance when the snake entered the body of the animal through the tusk and began to screw its head. Unable to bear this torture, the elephant decided to kill the creature inside and also end itself, dashed forcibly against the rocks profusely bleeding. The roaring of the elephant and the noise it made while dashing against the rocks frightened all the beings. Birds flew high. The celestial beings too were frightened. The snake was torn to pieces. Breaking its head, the elephant also breathed its last. Lord Seekalathiappar appeared on his bull vehicle with Consort Uma, granted Sarupa Mukthi (salvation) to both the snake and the elephant. The letter See in Tamil represents Silandhi the Spider, Kalam the snake and Athi (Hasthi in Sanskrit) the elephant. All combined, the place is named Seekalathi. There are several other legends connected to the glory of the temple. Prominent among them is of Parvati who was cursed by Lord Shiva to discard her heavenly body and assume the human form. To get rid of the above curse Parvati did a long penance here. Pleased with her deep devotion Lord Shiva again recreated her body – a hundred times better than her previous heavenly body and initiated various mantras including the Panchakshari. Consequent of this, Parvati gained and came to be known as Shiva-Gnanam Gnana Prasunamba or Gnana Prasunambika Devi. Cursed to become a ghost, Ghanakala prayed at Srikalahasti for 15 years and after chanting Bhairava Mantra many times Lord Shiva restored her original form. To Bhakta Markandeya, Lord Shiva appeared in Srikalahasti and preached that a Guru alone could make esoteric teachings and, therefore he is Brahma, Vishnu and Maheswara. Maha Shivaratri which occurs in the Tamil month of Maasi (Feb 15 through March 15) is one of the greatest festival seasons here, and the celebrations are marked by processions of the deities. The fifth day of the festival in the month of Maasi coincides with the Maha Shivaratri. The Sivarathri Brahmotsavam is a 12-day festival of great importance that attracts lakhs of people from various parts of our country. Mahasivarathri, Nandi Seva, Lingodbhavam, Rathotsavam, Teppotsavam and Sri Swami-Ammavarla Kalyanotsavam are the important aspects of this festival. Makara Sankranthi (Pongal) in January, Oonjal festival on all Fridays, Thirukarthigai in November-December. Srikalahasteeswara Swamy Srikalahasti Temple is purported because the Rahu Kethu Kshetra, People who have Rahu Kethu Dosha generally have problems in marriage, progeny and various long term sufferings perform the Rahu Kethu Sarpa Dosha Nirvana Puja. It is a time tested belief that all the Doshas get removed and desired results occur after the puja. Thousands of Devotees from the country and abroad perform this puja and fulfill their vows once more and once more when receiving smart results. Kannappar performed abishek to the Lord bringing water from the Swarnamukhi river in his mouth. Vibhuti Prasad is not offered in this temple, but symbolizing the Abishek Theeratha of Kannappar, only Theertha Prasad (water) is offered to the devotees mixed with Pachai Karpooram. It is offered through a conch. The Vibhuti (sacred ash) brought by the devotees are placed at the feet of the Lord, an arati is offered and returned to the devotee. Abishek is performed to the Lord only with water mixed with Pachai Karpooram. Other Abisheks are offered only to the stage (called Avudayar – the Linga Peetam) As the Shrine is related to Rahu-Ketu planets, devotees do the pradikshana in an anti-clockwise way. After fulfilment of the prayers, devotees perform Abhishek to the Lord, offer Vasthras (clothes) and also offer donation for the maintenance of the temple depending on their affordability. Kalahasthi temple is closely attached with the history of Kannappar, whose bhakti (devotion) is yet to be equalled in the history of the religious literature of Tamilnadu. Acharya Shankara had devoted a verse in praise of Kannappar in his celebrated Shivanandalahari. Sekkiizhar, in his Periapuranam elaborately sings the greatness of Kannappar in 185 verses. Sri Kalathinathar is a Swaymbumurthi blessing the devotees. As Kalahasthi belongs to the Vayu (wind) nature of the Panchaboodha shrines, the lamp in the sanctum sanctorum will be always oscillating. The singers associated with this temple are Sundarar, Appar and Gnanasambandar. In Thevaram hymns, this is the 19th temple located on the Cauvery bank in the Thondaimandalam region that is largely praised in the hymns. Of the nine planets, Kalahasthi’s importance is attached to Rahu and Ketu (Dragon’s tail and head respectively) those afflicted with the adverse effects of these planets and problems related to snakes, pray here for relief. Everyday men in distress, men seeking knowledge and wealth and men imbued with wisdom flock to this sacred place and return with contentment. From time immemorial countless gods, sages, saints, sinners and other devotees worshiped here and attained salvation. This holy place continues to draw thousands of devotees seeking fulfilment of their desires. 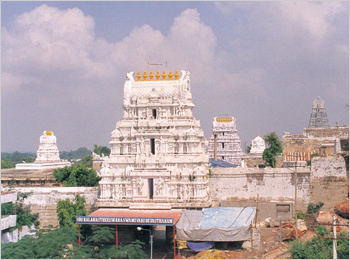 Sri Subrahmanya Swamy Temple, devoted to Lord Murugan, is located in the center of the Srikalahasti town. The Aadi krithika festival is the major festival celebrated in this temple. This festival is celebrated for 8 days, when Lord Subrahmanya Swamy and his consorts Sri Valli and Devasena are taken out for a procession on different vahanams. The Aadi Krithika festival concludes with Theppotsavam and Kalyanotsavam that are conducted on 7th and 8th day respectively. In this temple Lord Venkateswara Swamy is worshipped as Prasanna Varadaraja Swamy. This temple is one of the prominent temples located near the Srikalahasti Temple and in the midst of the Srikalahasti town. Bharadwaja Tirtham is situated east of the Srikalahasti temple, amidst three hills. There is a sannidhi of Panchamukheswara on the hill top, along with some ancient sculptures. It is believed that during the Krita Yuga, Maharishi Bharadwaja meditated at this site. There is also a small statue of Lord Vinayaka ath this theertham. Durgambika temple, dedicated to Goddess Durgambika, is one of the ancient temple in Srikalahasti. There are broad steps in the hillock that lead to the shrine of Goddess Durgambika. It is located near the Srikalahasti temple. Sahasra Linga temple has 1000 shiva Lingas enshrined within a single shrine. It is located in the 8kms from Srikalahasti. It lies in the middle of a forest, with a hill in its backdrop. It is an interesting place and there is a water falls which is flowing from the top of the hills and the water flowing there has many medicinal values which can cure skin diseases. Thondamanadu Sri Venkateshwara Swamy Temple was constructed by Thondaman Chakravarthy, brother of Sri Padmavathi Ammavaru. This temple is Located 10 km away from the main Srikalahasti temple and is the sole temple in the region which has Lord Venkateshwara along with his consorts, Sri Lakshmi Devi and Padmavathi Ammavaru. Gudimallam is a historical temple in the Srikalahasti Mandal which lies close to the Renigunta Railway Station. A Shiva Linga, discovered between the 1st century and 2nd century BC, is installed in the garbhagriha of the Parasurameswara Temple. The main temple sanctum is situated at a lower level as compared to the main floor level of the Mukhamantapa and Antarala. 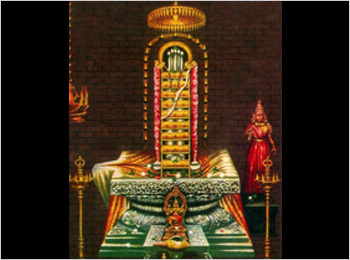 Legends believe that the shiva linga in the temple is a manifestation of Trimurti, with Shiva on the top, Vishnu in the middle and Brahma at the bottom. 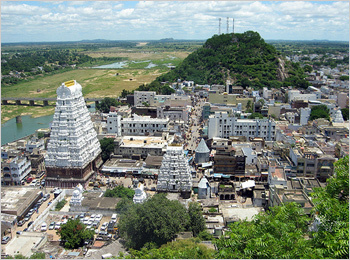 It is located 28 kms from Srikalahasti. Chaturmukeshvara temple has an idol of Lord Shiva with four faces and has bas relief carvings. At this temple, Lord Brahma and Lord Shiva are both worshipped. According to a legend, this is the place where Lord Brahma regained his ability to create after he pleaded forgiveness from Lord Shiva for getting rid of his Sisihathya sins. The nearest airport is in Chennai. The nearest railway station is Kalahasthi. Those taking the rail route, can reach Kalahasthi and proceed northeast to reach the temple. There are also bus facilities that are available from Tirupathi, Renigunta, Kancheepuram and Tiruthani. The temple is open from 5:00 am to 12:00 pm and 5:00 pm to 9:00 pm.